Editor’s Note: Thanu Yakupitiyage was interviewed by The Real News to discuss how OWS is handling immigration issues; take a look. North America’s state and corporate wealth is largely based on the subsidies provided by the theft of Indigenous lands and resources. Colonial conquest was designed to ensure forced displacement of Indigenous peoples from their territories, the destruction of autonomy and self-determination in Indigenous self-governance, and the assimilation of Indigenous peoples’ cultures and traditions. Given the devastating cultural, spiritual, economic, linguistic, and political impacts on Indigenous people, any serious social or environmental justice movement must necessarily include non-native solidarity in the fight against colonization. It is a positive sign that a growing number of social movements are recognizing that Indigenous self-determination must become the foundation for all our broader social-justice mobilizing. Indigenous peoples are the most impacted by the pillage of lands, experience disproportionate poverty and homelessness, are over-represented in statistics of missing and murdered women, and are the primary targets of repressive policing and prosecutions in the criminal injustice system. Rather than being treated as a single issue within a laundry list of demands, Indigenous self-determination is increasingly understood as intertwined with struggles against racism, poverty, police violence, war and occupation, violence against women, and environmental justice. Intersectional approaches can, however, subordinate and compartmentalize Indigenous struggle within the machinery of existing Leftist narratives: anarchists point to the anti-authoritarian tendencies within Indigenous communities, environmentalists highlight the connection to land that Indigenous communities have, anti-racists subsume Indigenous people into the broader discourse about systemic oppression, and women’s organizations point to relentless violence borne by Indigenous women in discussions about patriarchy. A few weeks ago on the train my mind drifted to Mohammed Bouazizi and a great sorrow descended over me. I thought of how his tremendous sacrifice on the 17th of December 2010 was the literal spark that set the fire for uprisings around the world. I thought of how an ordinary Tunisian street vendor profoundly affected the lives of millions of people everywhere with his tragic protest. His self-immolation captured the immense anger and frustration that millions experience on a daily basis. By setting himself on fire in front of the local governor’s office, Bouazizi showed the world that he could no longer endure the harassment and humiliation he suffered at the hands of corrupt local authorities. His example shows how revolutions start from the ground up, from ordinary people who are fed up of being pushed around. 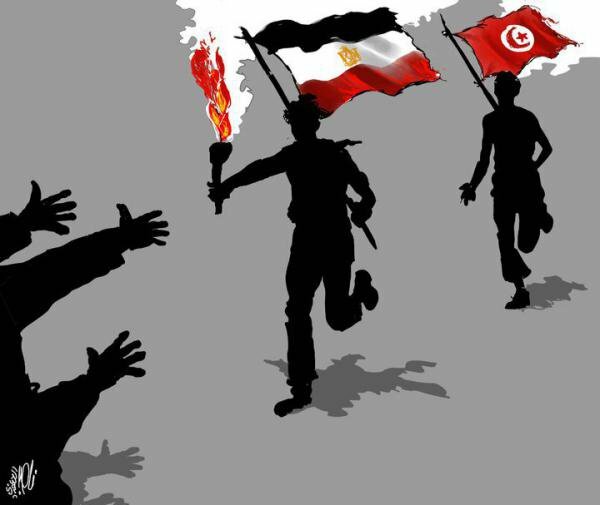 His actions set off revolutions in Tunisia and Egypt, uprisings in Bahrain, Syria, Libya, Yemen, and throughout the Arab world, as well as in Greece, Spain, the United Kingdom, and the United States. What’s been most remarkable is that despite the War on Terror and its racist underpinnings, in 2011 Europeans and Americans learned how to revolt and protest from Arabs and Muslims. In just a few months, by demanding that regimes supported by Western governments end once and for all, the people of the Middle East defeated centuries of Orientalist notions that they are backward, ignorant, and not ready for democracy. Alongside the toppled regimes lies Orientalism. It is wonderfully astonishing that the reference point for Madrid, Rome, London, New York, Oakland, etc, is the Arab world. Last night I was talking with a group of activists/organizers from around the country about their impressions of the OWS movement. They were curious how the insights of a therapist and conflict facilitator schooled in Worldwork (which was developed by Arnold Mindell) might be useful to folks in the movement. After our teleconference, the activists encouraged me to write this. We can learn from critics in at least two ways. They can help us improve by pointing out what we genuinely need to change. Paradoxically, they may be criticizing us for something we actually need to do more congruently. Seen from this angle, critics may be highlighting strengths we don’t yet know we have. Take one criticism: The General Assemblies lead to a kind of individualism of people wanting to be heard and contribute, unaware of the impact on the thousand people listening. In one recent GA, a small group of frustrated men hijacked the meeting, cursing and physically threatening the entire assembly. Even in less dramatic situations, most GA’s are filled with judgment, fracturing statements, and individuals repeating each other just so they can get themselves heard. From one point of view, the criticism is valid. Yes, Western individualism can be very problematic and it is always a good time to learn to become communitarian. But perhaps there is also something beautiful about this individualism. People have the sense that they can finally speak up about the economy, that their voice is important, that they do not have to shut up and listen to talking heads who supposedly know better. Editor’s note: Numerous community organizations have planning actions for D6 for many weeks; we are publicizing D6 as an act of support.